Hang around with a group of Evangelical Christians for awhile and the topic of homosexuality will surely come up. This isn’t necessarily a bad thing but Christians tend to put each other in one of two groups. There’s the mega liberal group comprised of Socialists, Democrats, Methodists, and/or apostates that not only believe homosexuality is okay with God, he ordains it because they give us modern fashion and make the property values in our neighborhoods go up. The other group is the dumb, hateful, Fox News worshiping kind that believe homosexuality is the cause of AIDS, rising gas prices, and Barrack Obama. Which are you, a blaspheming Socialist or a hate-mongering member of the Westboro Baptist Church? You only have two options and you have to choose, right now. Who cares? It’s a dumb question, and the wrong one to be asking. To be clear, I actually do care about the issue from a Biblical standpoint. I wouldn’t have read books on the topic it if I didn’t. My problem with the debate is that the question is often asked for the wrong reasons. Today, it’s too-often asked for people’s own agenda, instead of for furthering the Gospel. Let’s take a look at how ridiculous this sounds. Many Christians want to forbid these things simply because homosexuality is a sin. Why is homosexuality treated as the one sin that makes God get stomach cramps? Aren’t we all sinners? Have you ever seen a perfect nursery worker? The Bible talks about gluttony being as sin. Can you imagine the fallout if churches started treating chunky people like they have cooties? Let’s look at my own life for a second. I’ve hated people before, and the Bible says I’m a liar and a murderer. The Bible also equates lust with adultery. Oops. I’m also an American, which means I’m rich in comparison to the rest of the world. The Bible says it’s essentially impossible for me to enter into the Kingdom of God. It’s why I thank God for his grace because if it were up to the law, I would be a lying, murdering adulterer who is doomed for perdition. But even so, it’s okay for me to watch the kids in the nursery, go to Bible College, and have my minister’s license. After all, murderers aren’t that bad, right? But those homosexuals…we have to keep them away. And of course, the biggest issue is homosexual marriage. Again, because homosexuality is a sin, we can’t let them marry. We have to protect the sanctity of marriage. The problem with this logic is that it’s mind-blowingly hypocritical. If we really think that it is a Christian’s duty to make sure marriage is sanctified through political means, then we’re doing a really bad job at keeping it holy. Why are we not rallying to forbid divorce or remarriage for divorced people? Why are we rallying to make adultery a felony? And since Jesus equated lust with adultery, why aren’t we petitioning congress to create a lust Gestapo? Here’s my absolute favorite – the Bible treats divorce as a no-no, but if we get our marriage annulled, then it’s okay. We’ve given a secular judge the right to take the sin out of divorce. That’s the problem with legalizing morality. If we’re going to ban one thing based on a Biblical view of marriage, then we’d better ban everything else the Bible talks about in that respect. And I don’t see any Christians being okay with those ideas. Up to this point I’ve only picked on one group. However, the most important point I want to make is a problem that exists on both sides. In the heat of this debate, I wonder how often we forget about what we’re truly called to do: bring people in to the Kingdom of God; because at the end of the day, the only real thing that’s important is what Christ commanded us to do. So if you honestly believe that homosexuality is a sin, that’s great. What are your actions doing for the Kingdom of God? Will marginalizing homosexuals bring them to God? Will prohibiting marriage bring them closer to God? If you believe that homosexuality is not a sin, that’s great. Are you preaching tolerance and acceptance but no gospel? 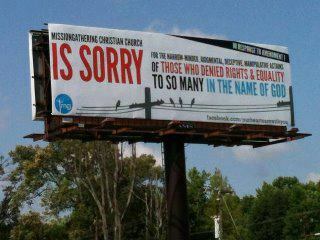 Are you too busy apologizing for people in the other group but not telling people about Jesus? Everything must be viewed as secondary to the Gospel. Everything. …Okay, fine. I’ll give you my answer…. Who cares? It’s a dumb question and the wrong one to be asking.